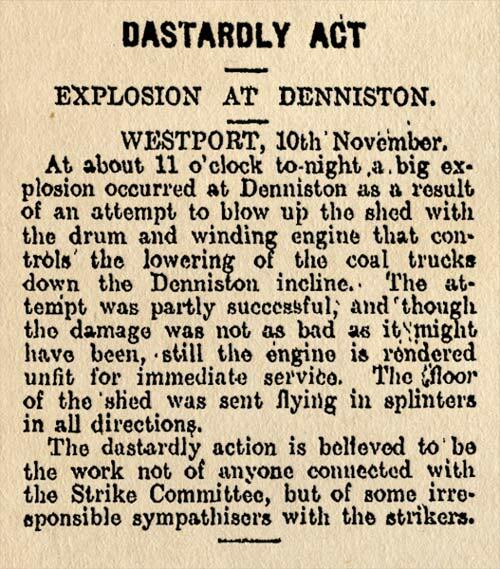 This newspaper article from the Evening Post of 11 November 1913 reports on an act of sabotage at Denniston during the 1913 general strike. Sometimes called the 'Great Strike', it involved about 16,000 workers. It was led by unions such as the watersiders, miners, labourers and drivers, centred around the United Federation of Labour or 'Red Feds'. It was widely seen as a trial of strength between the militant unions on the one side, and the employers and farmers, backed by William Massey's Reform government, which was determined to break the power of the militants, on the other. Special constables and strike-breakers were employed, with violent clashes in some places, particularly on the streets of Wellington. The West Coast, with a strong contingent of militant coal miners, was another region heavily involved in the strike. The explosion at the winding shed on the Denniston incline temporarily stopped its operation. The Denniston incline was a rail system that transported coal trucks up and down the steep slope from the Denniston plateau. Despite the militant reputation of Denniston unionists, even the papers of the time admitted the action was not likely to have been approved by the striking workers.